Click on the thumbs below to see the CAMA 15mm range in action! Battlefield Terrain, Fortifications and Objectives!! At BAUEDA we pride ourselves on our attention to historical accuracy and this range is here to do justice to the more modern battlefields, starting with WWII. Most of these models can be used for many more armies and settings than those specifically listed. 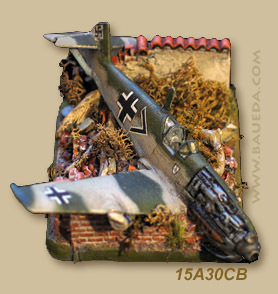 All scenic bases are especially designed to be compatible with Flames of War™ rules. All our models are made with very high quality POLYURETHANE resin. This is a much, much better material than what many other terrain manufacturers use, it is very tough, hardwearing, it doesn't smell and won't chip for anything less than hammer and chisel! Except where there are very thin cast details present, dropping our models on the floor won't generally harm them (and in general, neither would throwing them out of the window!). Unsurprisingly material of this quality comes to a price, but keep in mind you are getting a scenic piece that is not only most beautifully sculpted, it will also last you a lifetime! Designs specifically themed for the Pacific theater (or Vietnam/Korea War) are in the planning stage as well as yet more bunker designs, more objectives, and much more still, so keep an eye on this page! Please remember that as with all resin models these have to be washed thoroughly with hot water and a strong detergent before painting, to clean off all traces of mold release agent. If you don't follow this simple precaution the paint may flake off! Below you'll find a list of all the new models that are currently in development. For a full explanation of the progress bar indicators click here. In any case we aim to please, so if there is anything in particular you would like and it is missing and we will do everything we can to fix that!